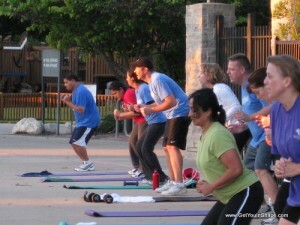 What Fitness Trend Will You Try in 2010? A few days ago we gave you the top 10 fitness trends that you can expect in the New Year. I’ve already jumped on the TRX love boat and I’ve So You Think You Can Danced with the best of them. But I’d love to add a full gym to the home decor in 2010. What about you? Can’t see the poll? Click here! I got a Bodybugg in September and plan on continuing to use it to help me lose weight & get in even better shape!! I want that dang Physique 57 dvd dangit. I have recently expanded my set of kettlebells and will be using them in conjunction with the rest of my free weights and my spinning bike to try and finally lose that 10 lbs. It’s not necessarily about “new” chez FST, it’s more about consistency. LOVE LOVE LOVE the Wii Fit Plus hubby got me for Christmas! Gotta love “working out” while I PLAY with my kids! My oldest is getting pretty good at snowball fight and ski jump!! If you love Physique 57, exhale, circuit training, functional training…you’ll LOVE spx fitness at beyond pilates dallas.